The women’s rowing team’s spring season began on March 18 in Tampa as the team competed at the Mayor’s Cup. The team placed top three in all three events competing only against USF’s club team. Sophomore Taylor Pecci and senior Mary Grace Duethman raced together in the Women’s Collegiate/Open 2 against two of USF’s boats and came in second place clocking in at 7:00.56. The team placed two boats against USF in the Women’s Collegiate Novice 4+. The A-boat with freshman Cassie Bricker, freshman Maddy Merz, freshman Samantha Stewart and freshman Dom Rocheford came in first with a time of 6:39.49. The B-boat with freshman Abbie Heupel, freshman Hanna Vernetti, freshman Madeyln Gimenez and freshman Bridget Maxwell tied for second with USF at 6:47.36. UT came in first place in their final event in the Women’s Collegiate Varsity /Open 4+ with a time of 6:14.32. Senior Stephanie Pascual, sophomore Maxie-Lew Dunn, Rocheford, junior Sara Staats all competed in this event. Pascual was one of the rowers on the team who competed in the Women’s Collegiate Varsity/Open 4+. Pascual said the team performed well at the Mayor’s Cup having placed in the top three, especially having novice rowers that have never competed in a regatta before. Having the first regatta under their belt, Staats said they had the chance to see how well the team competed in a racing situation after only practicing since their last meet in November during the fall season at the Head of the South regatta. Staats believes the team still has some work to do for races further down the road, but Mayor’s Cup was a good way to benchmark themselves and where they are coming into the spring season. Coming out of the Mayor’s Cup, the team prepares for the Florida Intercollegiate Rowing Association (FIRA) Championships. Where instead of competing against one team, they will compete against 20. 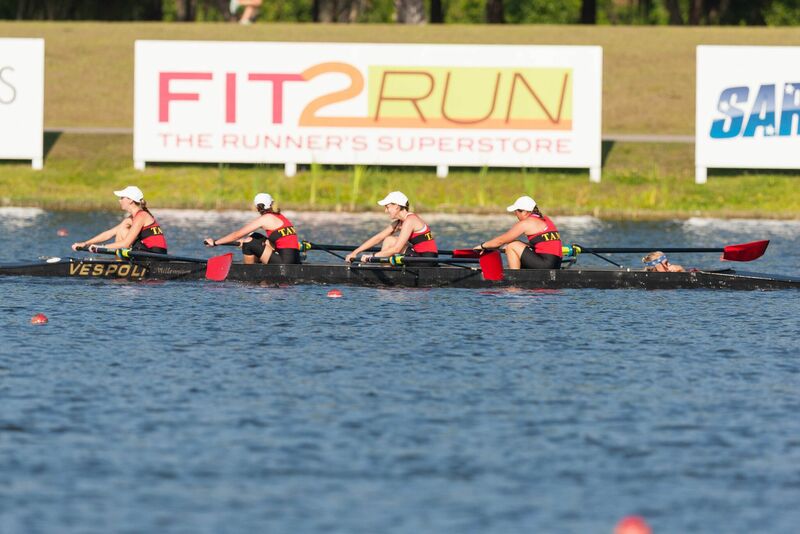 “It will be a whole different thing competition wise,” head coach Bill Dunlap said of the FIRA Championships that will take place March 31 in Sarasota. Out of the 20 other teams racing, Georgia Tech and UF’s club teams are expected to be the strongest competitors for UT. Despite the competition, Staats is looking forward to competing at the FIRA Championships. It’s an opportunity to race other teams that the team doesn’t have the chance to race in the first part of the season. Staats will be competing at FIRA Championships in the Women’s Collegiate Varsity/Open 4+ as she did at the Mayor’s Cup. Looking forward to the rest of the season, Dunlap feels the team has a good shot with the season because of the emphasis he puts on the lightweight races. Before each race all teams weigh in and lightweights are 130 pounds or less, which is what the program puts emphasis on when choosing rowers. “Part of my job is putting people where they have the best chance of being successful and if you’ve got lightweights it’s not right to put them against [open weights],” Dunlap said. Pascual is hoping the team will prove that UT is force to be reckoned with in the remaining spring season. “I think that we have an incredible team with a brand new addition of great novice rowers and we hope to continue to grow as a team, and prove to other crews that UT is team to be aware of because we will be taking on this season with all that we’ve got,” Pascual said.